The 4th generation also uses a new operating system TVOS (marketed by Apple stylized as tvOS) with an associated app store, allowing download of third-party apps for video, audio, games, and other content – initially from a limited range of providers on release, with others able to release further apps using new APIs allowing them to do so. A requirement of these apps and games is that they all must include interfacing with the new touchpad-enabled Siri remote. TVOS is 95% based on iOS 9 with the interface and APIs being tweaked to support the big screen. 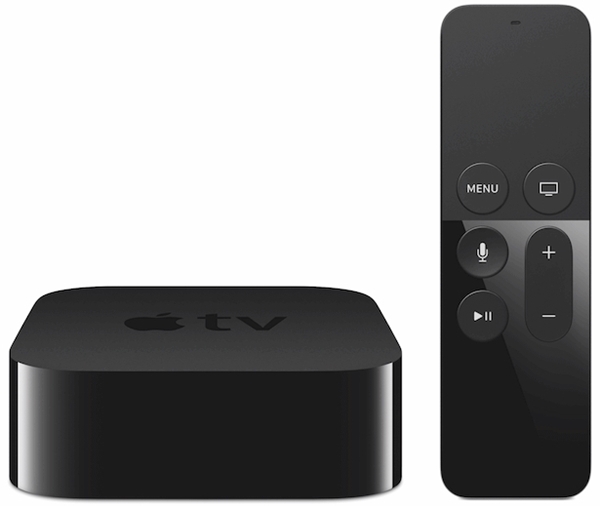 tvOS is an operating system developed by Apple Inc. for their fourth generation Apple TV digital media player. 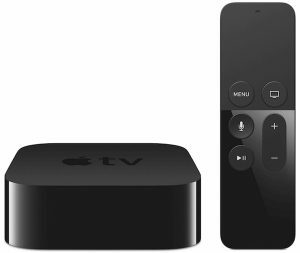 tvOS 9 is shipped with many new features on the fourth generation Apple TV. One of the major features was the ability to move through the interface with the new touchpad remote using multi-touch gestures. It introduced an all new App Store in which users can download and install new applications (such as apps and games) made available from developers that develop applications for the Apple TV and tvOS. tvOS 9 adds support for Siri which lets users do a multitude of things such as a cross-application search for a movie/TV show, rewind, fast forward, name and actor/director of the current movie, and even skip back 15 seconds. tvOS also added support for an application switcher on the Apple TV, more application customization options, cinematic screensavers, and control the TV using the included Siri Remote with the built-in support for HDMI-CEC in tvOS. In addition, tvOS allows the user to control the Apple TV in many different ways. These include using the included Siri Remote, pairing a third-party universal remote, pairing an MFI Gamepad to control games, using the Remote app on iOS, and pairing a Bluetooth Keyboard to aid in the typing experience of the user. 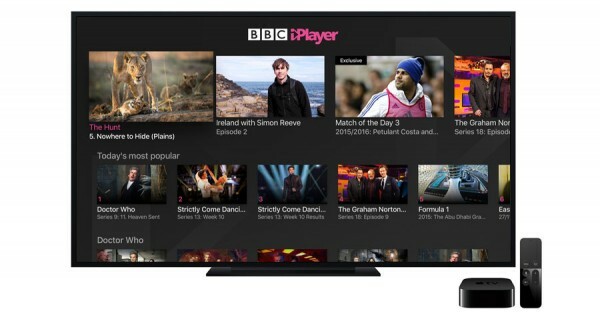 BBC has redesigned its hugely popular catch-up streaming service with a native tvOS interface. Programmes are sorted either by channel or genre. The app includes on-demand and live content from BBC One, BBC Two, BBC Three, BBC Four, CBeebies and more. In the UK you can browse through the BBC’s live channels, recommendations, favourite programmes, search, and the 30-day archive. You can pause and rewind, too. Currently there are no subtitles on the BBC iPlayer app, Apple does not support the subtitle format used for BBC iPlayer, so it’s not possible to turn on subtitles at this time. Purchased content from the BBC Store can be watched on the Apple TV through the app. BBC is working on integrating its app with Apple’s universal search, making it possible to use Siri to find TV programmes and content. Variable Bit-rate (VBR) aims to deliver the best sound and picture quality achievable using the Internet connection which is available to a viewer at any given time. Such systems can support both live and on-demand media streaming. The Variable Bit-rate (VBR) system tries to avoid pauses for buffering by selecting a lower quality stream if the Internet connection speed falls, returning to a higher quality stream when conditions improve. Under Settings & Help choose ‘Best Quality’. All BBC services are available in HLS using the AAC codec, this is a native Apple format. What do these settings mean for programmes on BBC iPlayer? When ‘Allow All TV Shows’ is set, play the programme regardless of whether it has Guidance. When ‘CAUTION’ is set, then you’ll be prompted for your PIN when the programme has associated Guidance. When ‘Don’t Allow TV Shows’ is set then you’ll be prompted for your PIN for every programme (regardless of Guidance).